A wintry storm system bringing heavy rain, flooding and whipping winds brought headaches for Thanksgiving travelers Wednesday, causing airport and road delays across the tri-state area, and could end up grounding the beloved Macy's parade balloons on Thursday. 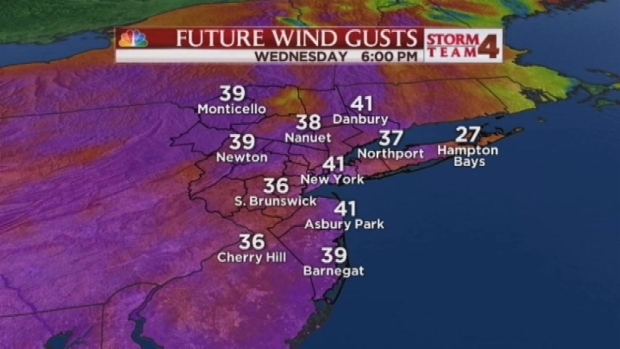 Most of the tri-state area was under a high wind advisory Wednesday, and gusts of up to 50 mph are possible. Area airports were prepared for weather-driven delays on one of the biggest travel days of the year. Lines snaked through LaGuardia Airport beginning early Wednesday as travelers tried to make it through security early. The wintry storm system has delayed flights at airports in the New York City area. Roseanne Colletti reports. The NJ Transit terminal at Penn Station was packed Wednesday evening because of service delays after a train leaving New York was stuck in a tunnel. The problem, which was cleared by late evening, was not caused by weather, but still delayed the plans of commuters and travelers heading home for the holidays. Hundreds of flights were canceled at East Coast hubs, but it was a tiny fraction of the tens of thousands of scheduled flights. The rain dissipated Wednesday afternoon as temperatures dropped and winds picked up. Chris Cimino's forecast for Wednesday, November 27. On Thanksgiving, wind gusts are expected to reach the 30 to 35 mph range, with isolated gusts of up to 40 mph. Parade rules call for balloons to be grounded if winds surpass 23 mph or gusts pass 34 mph, and event organizers say they'll make the final call Thursday morning. Patchy icy spots are possible early Thursday where any water was left standing following Wednesday's rains. Slushy accumulation was possible in areas north and west of the city. Meteorologists say the weather turns colder Friday and Saturday. Clouds and a chance for showers return Sunday into Tuesday. Fierce winds expected to exceed 35 mph on Thanksgiving Day are threatening to ground the beloved cartoon balloons that float through Manhattan in the Macy's parade. News 4's Gus Rosendale reports.